Can bitcoin live on fees alone? A new Bank for International Settlements (BIS) report has reignited the debate over cryptocurrencies’ long-term viability. In a research paper released this week, Raphael Auer of the BIS’s Monetary and Economic department questions the long-term future of bitcoin, which relies on a distributed network of miners that expend electrical energy to secure the currency’s transaction history. The incentive mechanism built into bitcoin (and other cryptocurrencies that rely on a similar consensus algorithm) is called proof-of-work. By following an encryption algorithm to produce a string of numbers and letters in a predefined format, bitcoin miners—specially designed computers—are able to demonstrate that they have expended a given amount of computing processing power. In turn, this processing power translates to a real-world energy cost. Cryptocurrency investment product provider CoinShares recently estimated the bitcoin network’s power consumption as 4.7 gigawatts (GW). This energy expenditure has itself been the cause of controversy. In February last year the general manager of the BIS, Agustín Carstens, described bitcoin as “a combination of a bubble, a Ponzi scheme and an environmental disaster”. Bitcoin supporters take the opposite view, saying the cryptocurrency network can help to liberate stranded energy resources and is largely powered by environmentally friendly, renewable sources of electricity. The BIS’s latest criticism of bitcoin is more targeted, however. While noting the importance of mining income to the sustainability of the bitcoin network, Auer argues that the gradual disappearance of the monetary reward payable to miners for confirming each block of transaction data will lead to significant instability in the network’s ability to process payments. “Proof-of-work can only achieve payment security if mining income is high, but the transaction market cannot generate an adequate level of income. As a result, liquidity is set to deteriorate substantially in years to come,” Auer writes in the report. When the bitcoin network was launched in 2009, each miner solving the numerical puzzle necessary to confirm a block of transactions earned a ‘block reward’ of 50 bitcoins. Bitcoin’s code specifies that the block reward halves after every 210,000 blocks (or approximately every four years, since blocks are processed on average once every ten minutes). As a result, the block reward has now fallen to 12.5 coins per block and will decrease again (to 6.25 coins) in 2020. As well as earning the block reward, a successful bitcoin miner earns the collective fees from the transactions recorded within each block. Transaction fees—payable by each network participant wishing to make a bitcoin trade—are not fixed. Instead, they vary depending on the priority attached to the trade by the person initiating it: a higher fee guarantees the transaction will be timestamped into the next block, while low-fee transactions may have to wait several blocks for confirmation. 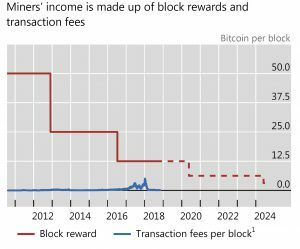 The BIS notes that, while historically the block reward has formed the largest part of bitcoin miners’ income, during the transaction fee spike of late 2017, the income from fees alone rose to around half the income derived from the block reward (see the chart below, taken from the BIS report). The average fee necessary for miners to print a bitcoin transaction into the blockchain hit a peak of over $60 on December 22 2017, shortly after bitcoin hit its price peak of nearly $20,000 per coin. However, transaction fees have since fallen back sharply. The cost of ensuring a transaction is printed into the next bitcoin block is currently $0.13, according to bitcoinfees.info. Whether bitcoin can survive the disappearance of the block reward has been discussed since the cryptocurrency’s inception. The pseudonymous designer of bitcoin, Satoshi Nakamoto, addressed the topic, arguing that the cryptocurrency’s miners could live in future on transaction fees alone. “Once a predetermined number of coins have entered circulation, the incentive can transition entirely to transaction fees and be completely inflation free,” Nakamoto wrote in the bitcoin white paper, published in 2008. The BIS’s Auer disagrees, arguing in his new paper that the eventual disappearance of the block reward is likely to lead to substantial delays in transaction processing times. “The economic design of the transaction market fails to generate high enough fees,” says Auer. “A simple model suggests that ultimately, it could take nearly a year, or 50,000 blocks, before a payment could be considered ‘final’,” he predicts. Instead of relying on proof-of-work to enforce consensus across the cryptocurrency network, says Auer, bitcoin (and similar cryptocurrencies) should consider changing their incentive mechanism. “In order to prevent liquidity from ebbing away, Bitcoin and other cryptocurrencies would need to depart from using proof-of-work—a system that is not sustainable without block rewards—and embrace other methods for achieving consensus on blockchain updates,” writes Auer. The developers behind ethereum, the third-largest cryptocurrency by market capitalisation, have been considering a switch from proof-of-work to another consensus mechanism called proof-of-stake. However, the switch has repeatedly been delayed due to concerns over its potential effect on the network’s security. The long-term viability of bitcoin based on transaction fees alone is defended, however, by many within the bitcoin community. Jameson Lopp, for example, a software engineer and chief technology officer at Casa, a company specialising in secure custody of cryptocurrencies, question’s the BIS’s assumptions and argues that transaction pricing in the bitcoin network has shown it can adjust dynamically to changing market conditions. “If the time between blocks becomes very long then there is effectively less block space being produced, and thus bitcoin users will have to compete over an even scarcer resource, which will mean that they will have to pay higher fees for timely confirmations,” Lopp told New Money Review. “As such, the incentive to mine will increase due to the higher fees, and the time between blocks will become shorter. It’s a natural equilibrium,” said Lopp. “The bigger question that nobody can answer for sure is what the total value of those fees will be, because it will affect the thermodynamic security of the network against 51% attacks. There are plenty of unknown variables. Ultimately the reward will drive the amount of money spent by miners on hardware and electricity,” said Lopp. Bitcoin mining has already changed dramatically in its first decade, from an activity feasible on home computers to a highly specialised industrial activity. A single Chinese-manufactured DragonMint 16T bitcoin miner, built around a specially designed chip called an Application-Specific Integrated Circuit (ASIC), can perform 16 Terahashes (16 million million hashes) per second. However, while bitcoin’s block reward will only disappear over a century from now, the network’s ability to survive largely on transaction fees will be tested much sooner. “10 years from now the block subsidy will already be something like 1 bitcoin,” Casa’s Lopp told New Money Review. And bitcoin wallet providers have learned lessons from the spike in transaction fees seen at the peak of the bull market, says Lopp. “It’s a good thing that we experienced the fee market in 2017,” he told New Money Review. UTXO management, practised by leading bitcoin wallet providers, allows bitcoin users to reduce their transaction costs by minimising transaction sizes at high fee rates, while also sweeping up and consolidating fragments of coins when fees are low.